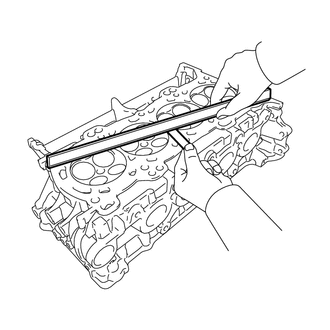 (a) Using a precision straightedge and feeler gauge, measure the warpage of the contact surfaces where the cylinder head contacts the cylinder block and manifold. 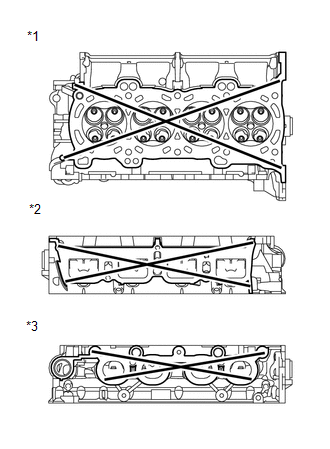 If the warpage is more than the maximum, replace the cylinder head. (b) Using a dye penetrant, check the intake ports, exhaust ports and cylinder surface for cracks. 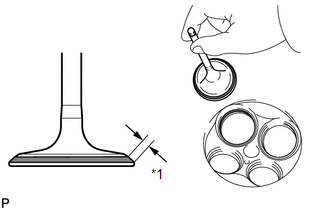 (a) Using a vernier caliper, measure the free length of the inner compression spring. 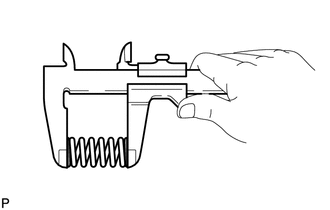 If the free length is not as specified, replace the spring. 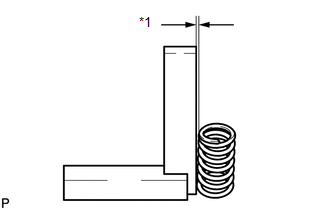 (b) Using a steel square, measure the deviation of the inner compression spring. 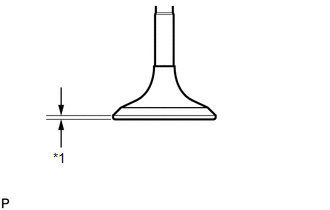 If the deviation is more than the maximum, replace the spring. 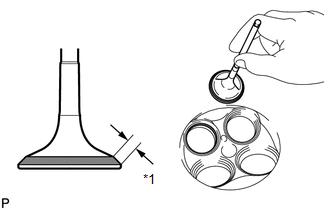 (a) Using a micrometer, measure the diameter of the valve stem. 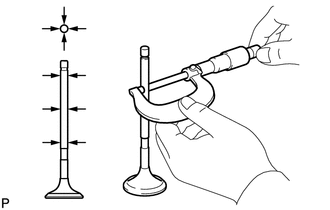 (b) Using a vernier caliper, measure the valve head margin thickness. 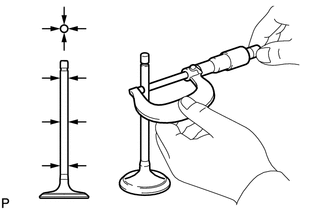 (c) Using a vernier caliper, measure the overall length of the valve. 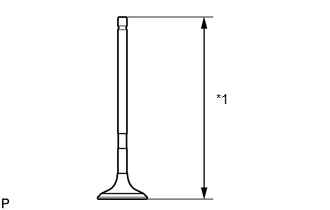 If the margin thickness is less than the minimum, replace the exhaust valve. If the oil clearance is more than the maximum, replace the valve and guide bush. (a) Apply a light coat of Prussian blue to the valve face. 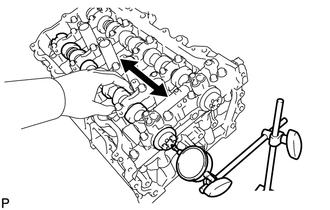 (b) Lightly press the valve face against the valve seat. Do not rotate the valve while pressing the valve. (c) Check the valve face and valve seat. 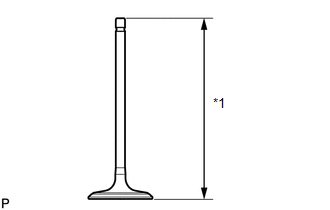 (1) Check that the contact surfaces of the valve seat and valve face are in the middle area of their respective surfaces, with the width between 1.1 and 1.5 mm (0.0433 and 0.0591 in.). If not, correct the valve seat. (2) Check that the contact surfaces of the valve seat and valve face are even around the entire valve seat. Do not turn the camshafts. (a) Clean the bearing caps, camshaft housing and camshaft journals. (b) Place the camshafts on the camshaft housing. (d) Install the camshaft bearing caps (See page ). (e) Install the camshaft housing sub-assembly (See page ). 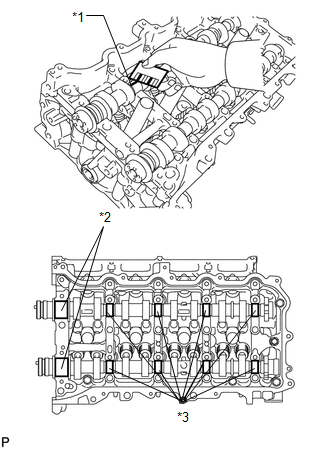 (f) Remove the camshaft bearing caps (See page ). (g) Measure the Plastigage at its widest point. If the oil clearance is more than the maximum, replace the camshaft. If necessary, replace the camshaft housing. 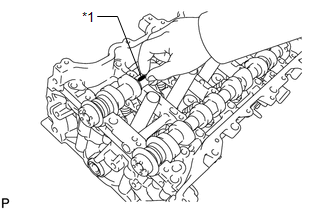 (a) Inspect the intake camshaft. (1) Install the intake camshaft. (2) Using a dial indicator, measure the thrust clearance while moving the camshaft back and forth. If the thrust clearance is more than the maximum, replace the camshaft housing. 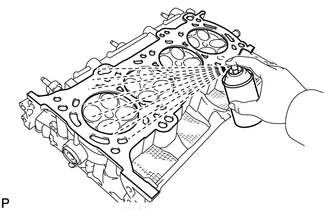 If the thrust surface is damaged, replace the camshaft. 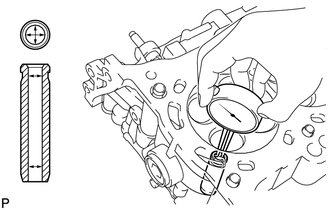 (b) Inspect the intake and exhaust camshafts. (1) Install the intake and exhaust camshafts.